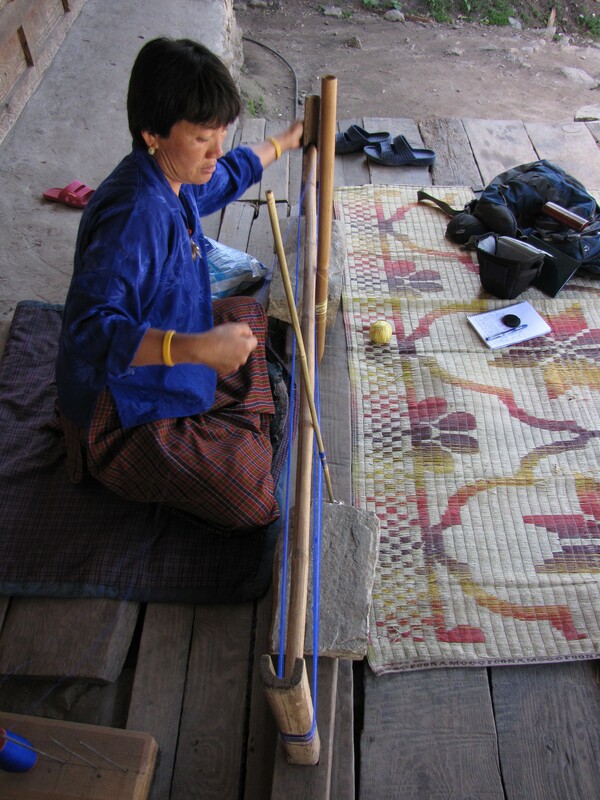 Warp preparation for the backstrap loom is done by winding the threads around a series of upright bamboo, wooden or plastic poles. The two largest are usually wooden L-shaped poles that are each weighted with a large stone, and a horizontal pole is placed between them. When the warp is placed on the loom, these are replaced by the two warp beams. The warp is usually created in a continuous circular loop. 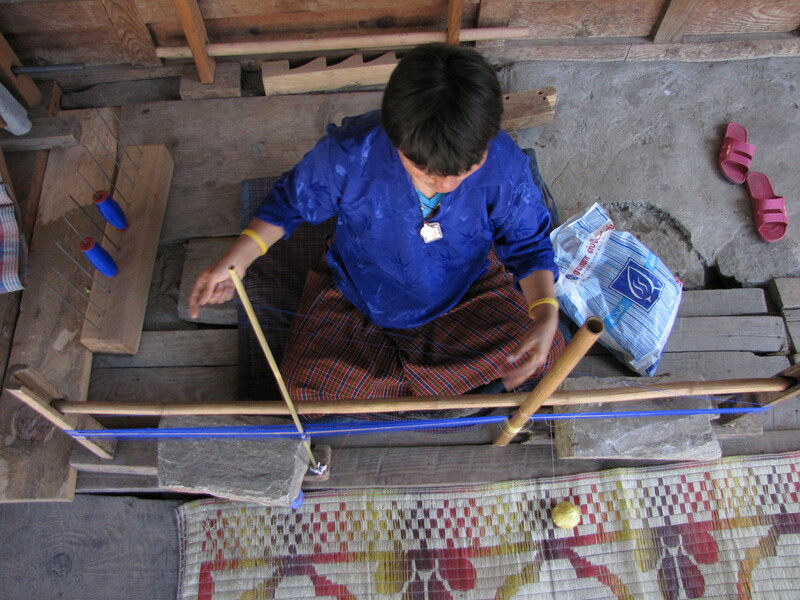 Between the larger poles are balanced at least 2 other poles: a larger one to hold the heddle threads and a thinner one which hold the warp threads in order and maintain their spacing on the loom. 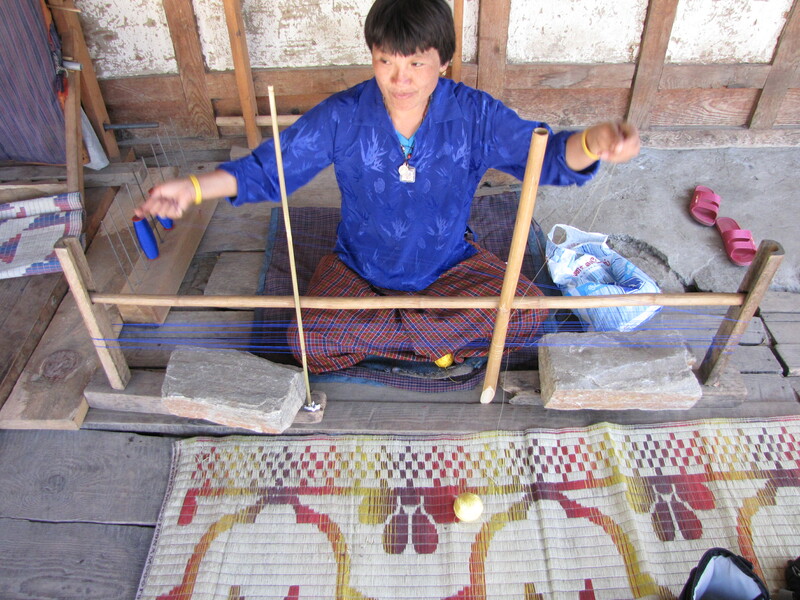 Sometimes a third pole is used and the winding direction is reversed around it, and it will become the closing rod on the loom. Extra poles may also be used if multiple heddles are being prepared for warp patterns, such as for Aikapur. The heddles are formed by looping a strong nylon thread back and forth between the warp threads and around the large centre rod as the warp is being wound around the outer poles. Usually two balls of thread are used at the same time, and on every circuit, one is looped around the thin pole and the other has the heddle thread looped around it. 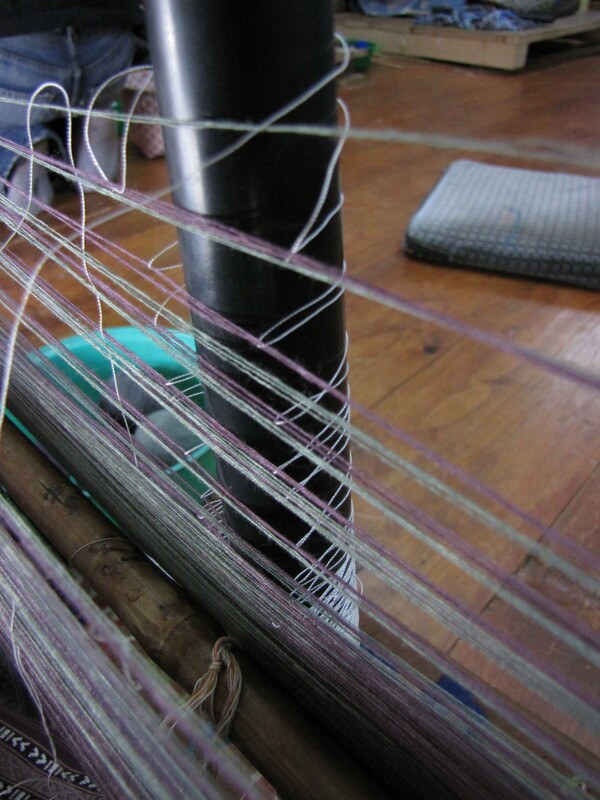 The closeup shows my first warp, using a ball of green cotton and a ball of purple cotton: purple threads were looped into the heddle and green were looped around the spacer rod. Using 2 colours helped me learn to warp and also made it very clear during weaving whether I had the large sword correctly placed through the shed, since on every row I either had all the green threads up or all the purple threads up. This entry was posted in Bhutanese Techniques and tagged Asian, Bhutan, loom, Textile, weaving by Wendy Garrity. Bookmark the permalink.